With Christmas right around the corner, hopefully most of your gifts are made (or purchased), and it’s time to start thinking about getting those gifts wrapped. tape, glue, scrap paper/cardstock, yarn, markers, hole punch, and a roll of 4-year-old wrapping paper (that I’m very stingy with). Don’t let wrapping be a daunting last-minute task this year; start wrapping now and enjoy the beautiful packages under the tree for a few days. I’ll show you a few of the gifts that are already under our tree and let you in on how I wrap without spending a penny! Wrapping gifts is NOT supposed to cost you a lot of money. I use wrapping paper sparingly and look for other wrapping options so it doesn’t hurt so much to watch people tear open gifts and throw away the wrappings. Use whatever you already have on hand – shop your house for things that can be used in place of wrapping paper, and things to adorn the top of a gift. 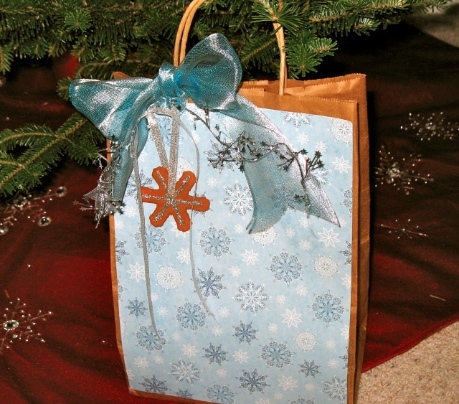 Simple wrapping materials include white butcher paper, brown paper bags, newspaper, boxes that can be covered, or gently used bags that can be rejuvenated with a little slice of pretty paper. 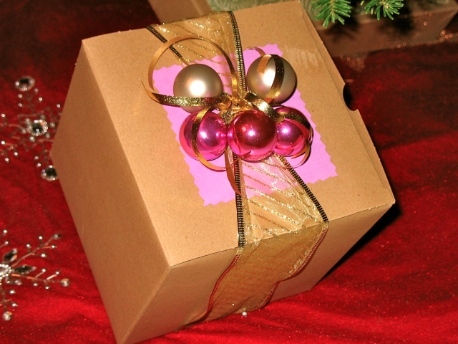 I always save nice brown boxes that can easily be transformed into a lovely package without much work. Check out some of the gifts I wrapped this year, using ONLY things I already had lying around the house. A bag of jingle bells I found in the basement became the inspiration for this wrap job. The small (used) brown box didn’t need much, so I made a pom-pom out of tulle my mom had given me, and attached a small tag I cut out of scraps of paper. I broke down and used a bit of wrapping paper for this small gift. 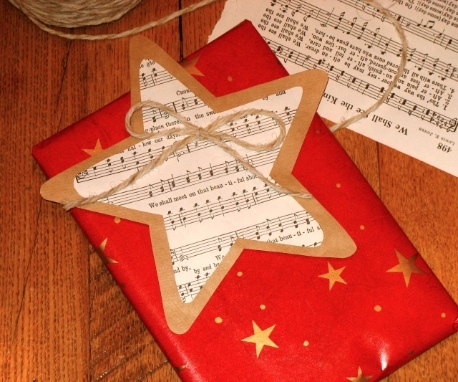 To stick with the star theme, I crafted a larger star out of a brown paper bag, old sheet music, and yarn. Thank you random blog for the star idea! I was loving the look of the music paper for tags, so I made a large letter (mounted on cardstock I dug out of the recycling bin). I think the fancy ribbon was originally from a wedding gift. Can you tell which department store the box is from? Nope, thanks to the paper hiding the logo. 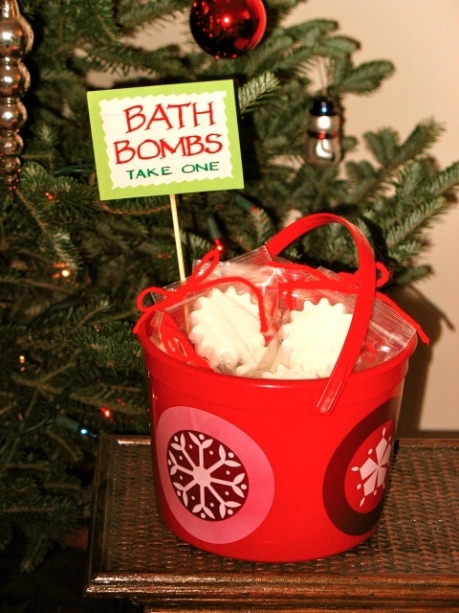 I took homemade bath bombs to a Christmas party the other night to share with everyone and wanted a cute way to display them. The bucket (that had been corralling tea bags in my pantry) worked perfectly for the party favor. I taped a little sign onto a wooden skewer to identify the bath bombs so party guests didn’t try to eat them. 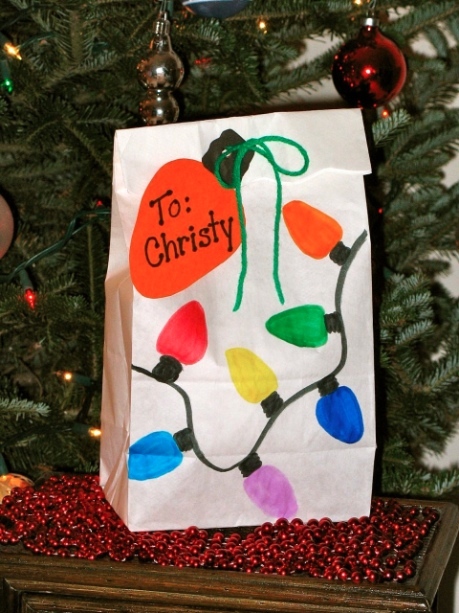 A simple white bag decorated with marker quickly became a holiday gift bag. The tag was made from scraps of paper in my craft bin, and tied on with a few inches of green yarn that’s too hideous for knitting projects. I spotted this package at my mom’s house and snapped a picture. She said all the materials used were scraps of things, which qualified her to be part of this article. I love how the pine cone gives an organic, wintery feel to this shiny gift. I disguised parts of this beat-up brown bag with pretty paper, and added a bundle of ribbon and garland to make it look fresh. A homemade applesauce ornament catches the eye to detract from my lack of bow-tying skills. I covered a store logo with a little paper on top of this box, then wrapped it with gold ribbon. The small ornaments on top decorated a gift I received a few years ago, and are finally making their second appearance. Nice! My mother would wrap presents in a baby blanket or towel and used a rattle in place of a bow for baby presents.Pillowcase or kitchen towel would be nice too.I sometimes buy candy instead of a bow for a child’s present.My children have a nice colledtion of ornaments when they flew the nest because their grandmother would put one on their gifts every year.I sew.I was going to make fabric bags but haven’t figured out how to keep children from peeking.Any suggestions? I love all these ideas. I wanted to share one as well. I save all my boxes from cereal and other food items. I use up my leftover paint from other projects and paint them without trying to cover completely. 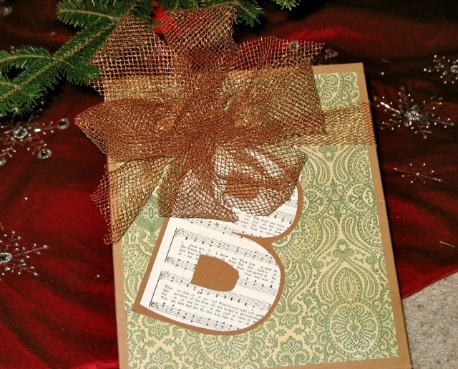 I then use leftover Christmas cards to embellish the boxes. They’re really cute when you use a picture card from a family’s previous Christmas. It’s a good way to personalize the boxes. I hole punch the sides of the boxes and add a ribbon. 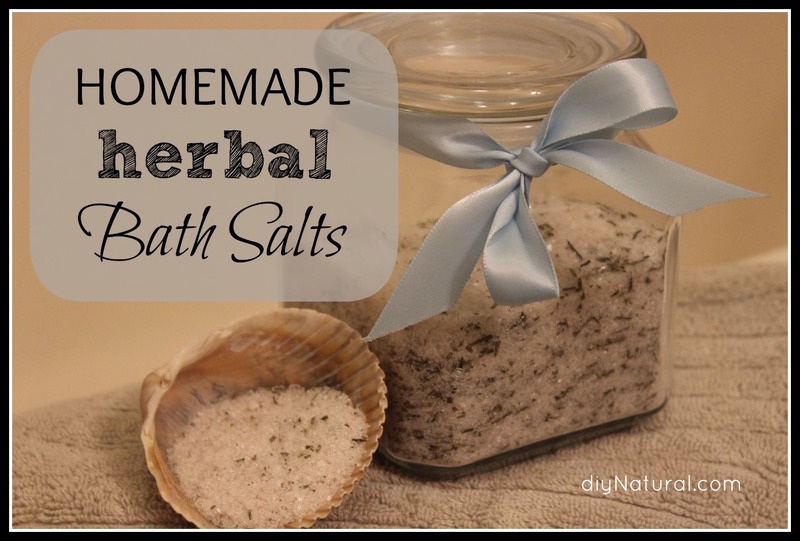 I get so many compliments on them and they are fun to make! Using the photo card to personalize is such a sweet idea! That whole project sounds like tons of fun too…thanks for sharing your cool ideas! If you are cheap but not crafty or just don’t have the time you can do like me and purchase your wrapping paper AFTER Christmas. It goes on mega mega sale and then gets stored in the attic. I enjoy the newspaper look more though in all honesty but I always get on sale after Christmas deals for next year. I’ll buy toys, lights, candy canes, wrapping paper, decorations, etc etc etc and just store it away. It’s nice having Christmas shopping done in January. You’re the person I’m always jealous of when December rolls around!!! You’ve got the right idea! 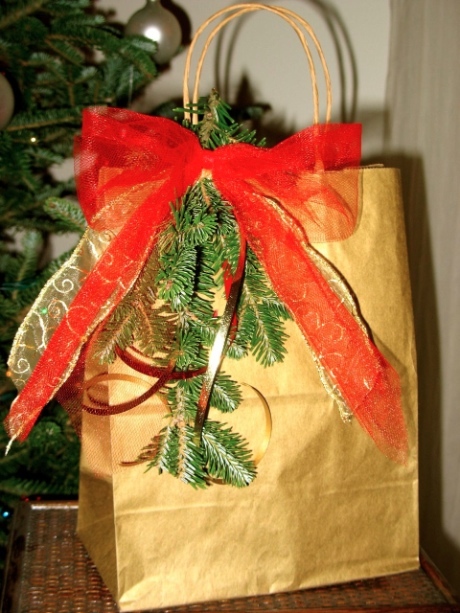 I absolutely love the brown bag with the piece of the Christmas tree and ribbon, simply beautiful! I always feel so wasteful when buying wrapping paper, and honestly I never can find one that I really like anyways. All of my presents are wrapped this year but I’ll bookmark this page for future presents! Love the new ideas to reuse to gift wrap. Thanks so much for all the wonderful ideas. My grandmother used old Christmas Cards and turned them into Christmas gift tags using pinking shears (to cut out just a portion of the card and a plain backing paper). She used a single hole punch in the corner to put a short ribbon to tie to the present and wrote the To and From portion on the plain backing paper. I’ve tried to keep the tradition alive since she is gone and it was a great idea to use the old Christmas cards. Awesome idea! Don’t you just hate throwing away a beautiful Christmas card? I have been holding on to some really cool ones and have been meaning to frame them to make into Christmas decorations. Got myself a new fresh post to boot! 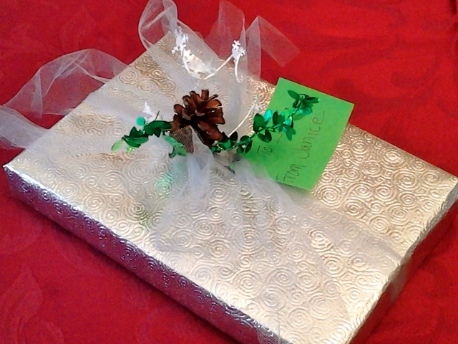 Thanks for sharing these wonderful ideas for wrapping gifts…..I love them all. Thank you! Love it – and it’s inspiration for me as I embark on some upcycle wrapping today. some great ideas. i like to wrap all of my presents in National Geographic photos, carefully pieced together out of my already heaping stash of magazines. Yes, magazine pages! What an awesome idea, and I have tons of sierra magazines with the most spectacular photos, thanks for sparking a thought! I just love this site, always great ideas perculating about. Betsy, the first picture with the jingle bells and tulle, I have to tell you what I’ve done, it looks the same. Instead of constructing a box, if the item to be wrapped is small, I’ve used toilet paper tubes, or paper towel tubes, made score lines on the ends and pushed them in to create a pillow box just like you’ve got pictured. Really does look the same. A scrap of wide ribbon or something like you’ve done for embellishment and you’re done. People I’ve given them to have had know idea they were lowly tp tubes, Lol! Oh my goodness! I’m totally trying that next time I have a small gift that will fit into one of those little tubes! Genius, Cassie! I keep all the bags and boxes that our gifts come wrapped in and reuse them every year and I’m still on the same roll of wrapping paper from 4 years ago. So adorable!! I’m trying to share this on Pinterest and for some reason am not able to. I do not see the ‘Pin It’ thing for the gift wrapping in specific. It is too cute! Forwarded it to my elderly Mom who loves unique gift-wrapping! Thanks! Hi Lisa, look at the very bottom of the article, right below the paragraph starting with the heading, “Thats A Wrap.” You’ll find the Pin IT button there. Thanks and blessings! 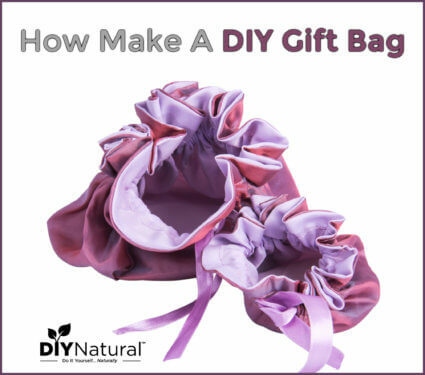 We always save all of our bags, ribbons, bows, tissue paper, etc. I have so much stuff saved up I think I could open my own store! We recycle everything we can…it always amazes me how people can be so wasteful & just throw it all away! 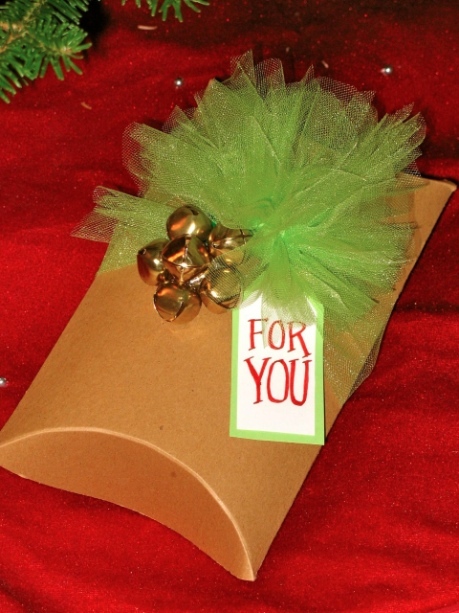 I come from a long line of crafty people & we take pride in our frugal but beautiful packages! 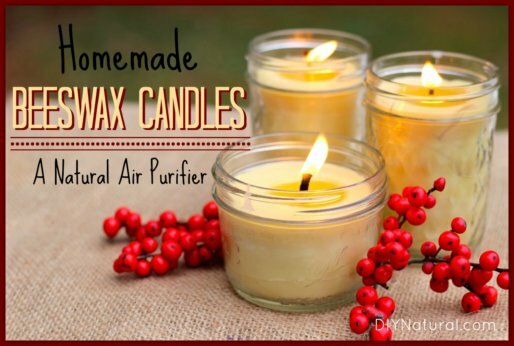 Shop your house – my favorite tip here. Thank you for the thoughtful post! The gift bags are a hot item in my family. My aunts always fight over who gets to take the bags and claim “dibs” on the ones they like, even if it’s not their gift! One year they wanted to help me start a collection of my own so I got all the bags that year. I am considering borrowing moms sewing machine to make a babywearing poncho and some re-usable snack/sandwich bags(I hate using all those plastic baggies – they aren’t expensive, but it adds up quick). Do it Melanie, those reusable sandwich bags are awesome! I did that one year. I wrapped it in Christmas fabric and put it in place with a pin. Kids don’t enjoy not being able to tear it though.